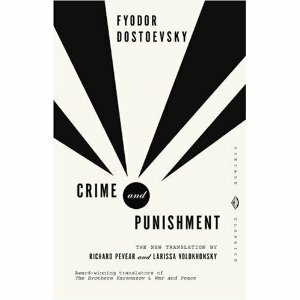 On re-reading Crime and Punishment. The Pevear/Volokhonsky translation of Crime and Punishment is excellent so far. I'm re-reading it for the first time since I was a teenager, in this totally different edition for the Classics Group discussion coming up at my library. The version I read when I was younger was the mass market paperback, published by Signet or another of that ilk, translated by Constance Garnett – the formerly ubiquitous translator of all works Russian. The more I read the more I realize I hardly remember anything from my first time through. Granted it has been a few years but I thought more would sound familiar. I also believe with maturity I see so much more clearly into all the philosophy and get more of the references that would have flown past me before. It is true, every time you read a book it's a totally different experience. This is an odd novel, its style hard to describe if you haven't read Russian literature. The best comparison I can think of would be a cross between a Dali painting and a really odd nightmare, with a couple murders thrown in for good measure. Oh, and the main character, Raskolnikov, is rapidly plummeting into insanity. So throw in a good dose of abnormal psychology to go along with the rest. At the same time,it's an accessible, easily read book if you don't count the occasional passages in which nothing seems to make any sense. But you go with it anyway, and eventually you come out of the fog. Unlike, say, Ulysses which never quite achieves reality and makes my head explode. The book has been giving me strange dreams. Last night I dreamed I was running away, during a war, the enemy shooting bowling balls at me via trebuchet. I was carrying a little girl, a toddler, possibly because I'd just read the passage in which main character Raskolnikov gives money to a wretchedly poor family with starving children. One of these children, aged 5, comes running after him to thank him, kissing him on the cheek with great passion for his kindness, which has temporarily saved her family. I love the Russians, but when I stop to really notice there's an awful lot of chaos going on. Characters come and go without transitions, scenes change, people burst out into passionate exclamations unexpectedly. I can honestly say I can't read a lot of this book in one sitting. It's first too mind-boggling, and second too damn depressing. Getting into Raskolnikov's brain is disturbing. It ranks up there with Dorian Gray and Humbert Humbert for complete lack of human feeling and philosophy of selfishness. But I've never turned away from a little complexity. Obscurity, yes. I've been defeated by many a post-modern. I just don't mind having to work a little. It's good for the brain. Now all I need are tips on developing spatial logic. I read this book in my late teens and all I remembered of it till I re-ead it about ten years ago were my feelings of astonishment and something like rapture on finding myself inside the mind of someone so utterly different from anyone I’d ever met. It was like opening a door into a room in my own house that I never knew existed. Mark you, I was a very late developer in the art of thinking for myself, so I was in dire need of a bit of shake up. Previous Post Pride goeth before a fall, or Further Proof America’s Got Talent. Next Post Don’t mess with a librarian, dude. You’ll be in for a world of pain.